Love in the Time of Zombies opened last night at Ballard Underground, produced by Vagabond Alley Productions in association with Pocket Theater, was the most entertaining and polished production I have seen in quite some time. The play, remarkably written by Damian Trasler, featured Susan and Brian, a married couple confronting the tension in their marriage that has been overlooked in light of the recent zombie apocalypse. When they hear a knock on their door, they are hesitant to open it, but when they do the tension builds, pushing the audience to the ends of their seats. The characters, Susan and Brian, were very believable projections of what two Average Joes would be like in an apocalyptic type of setting. The piece is very comedic, highly entertaining, and will have you rooting for the married couple, in all of their hot mess glory. The three-person cast, made up of D’Arcy Harrison, Jason Sharp, and Robert Hankins showcased the actor’s comedic strengths. Harrison played a very eccentric, frustrated housewife whose facial expressions will have you glued to her for the entire play, hoping that you don’t miss a single one of them. Harrison was hilarious, had impeccable timing, and charmed the audience with her eccentricity. Her chemistry with Sharp was perfect: her character clearly was frustrated with their marriage, but also found deep comfort in it. Though the acting could have easily stood up on its own, the play was also complemented with an incredible sound design that began the play with radio broadcasts that showed the spiraling of the zombie apocalypse. The sound design continued throughout the play, with hearing birds outside, as well as the growing rush of zombies and other noises. Robertson Witmer did an incredible job with the sound design. The makeup and special effects for Robert Hankins were also well-done, making me glad that Susan opened the door to Harry to let him into their home. Whether to not you enjoy zombie stories, I recommend making your way over to Ballard Underground to see this show while it is still running. You will walk away chuckling to yourself, that is for sure. Love in the Time of Zombies by Damian Trasler. Produced by Vagabond Alley Productions in association with Pocket Theater. At Ballard Underground. 2220 NW Market St. Seattle, WA 98107. Sat. June 14, 21, 28 at 10:00 pm. 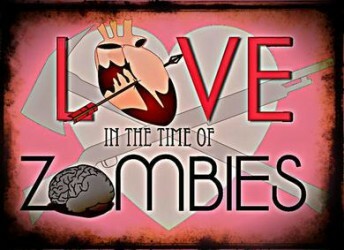 http://www.vagabondalley.com Tickets:https://pockettheater.vbotickets.com/event/Love_in_the_Time_of_Zombies_by_Damian_Trasler__Theater/4703. Street Parking Available.